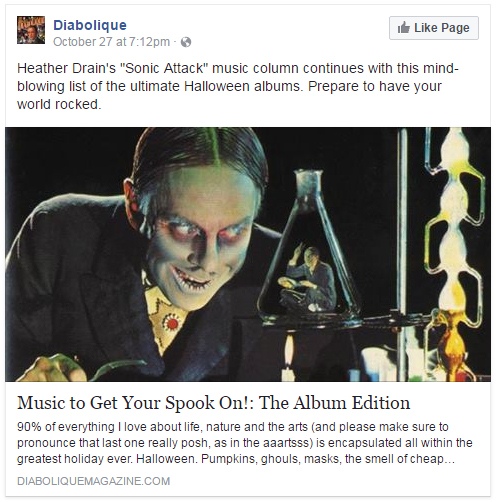 Heather Drain and Diabolique Magazine were kind enough to include Rain Station Dark Ride in their list of must own Halloween CDs. Check out, Music To Get Your Spook On. You can listen to the Dark Ride CD or watch the Halloween Animations at JackOLantern.ORG ~ So glad to be included (we’re number two on the list), Mark and I love this time of year. Rain Station = Halloween!!!! This entry was posted on Monday, October 31st, 2016 at 7:23 AM	and is filed under Halloween. You can follow any responses to this entry through the RSS 2.0 feed. You can leave a response, or trackback from your own site.